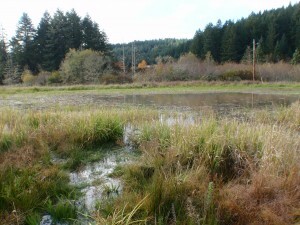 In 2009, an historic wetland was restored on the floodplain of Ervin Creek. Two ditches carried flow directly to Ervin Creek draining the wetland site. Western pond turtles and red-legged frogs were known to be present in the immediate area, however this site was not conducive to the hydrologic or vegetative conditions that would support this wildlife. In cooperation with US Fish & Wildlife Partners Program, a one-acre seasonal pond with shallow marshy edges was constructed. Complementing the wetland enhancement, a portion of the property was enrolled in the NRCS Conservation Reserve Enhancement Program (CREP) and planted with native trees and shrubs. This project was supported by Oregon Watershed Enhancement Board, US Fish & Wildlife Service, Benton Soil & Water Conservation District and NRCS Conservation Reserve Enhancement Program.